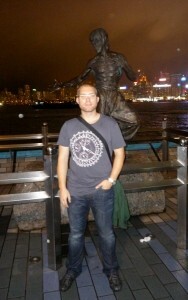 Hello again from Hong Kong. We have little bit of time because our AVAR Conference 2011 presentation starts at 14:45 at the Renaissance Harbour View Hotel so we can share a few pictures with you. We arrived to Hong Kong a few days before the conference in order to have time to accommodate to a different time zone and weather. We spent this time preparing our presentation, admiring the city, and meeting some interesting people. As first, we met some android figures in one of the local computer shops. 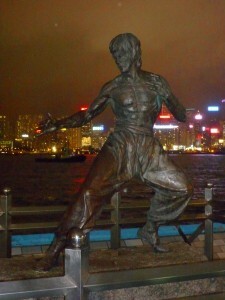 When we went to the Avenue of Stars to see the Symphony of Lights, we met Bruce Lee. You probably won't believe that the photos were taken by us until there is a real human in it. I'm attaching one of me with Bruce. I have to say that he wasn't talkative at all. One of must-see attractions here is the Night Temple market. 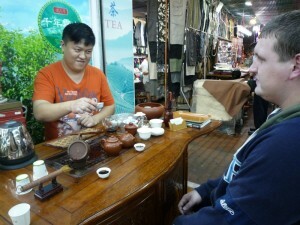 We had a wonderful time here at really interesting tea shop. Just a little different from a Czech pub.